Curbside recycling doesn’t cut it for these four small business owners. By building sustainability into their business models, entrepreneurs are finding unique ways to reduce their footprints and grow their businesses. Columbia University graduates and employees of Goldman Sachs, they were hitting the bar scene in New York City and getting sick of the lack of beverage variety. “Mixology was just becoming a new trend, so we started thinking about how to create a better drink,” Carter says. They took the acai berry, an antioxidant-rich fruit native to Brazil, and used it to flavor a new concoction. The result: a fruity spirit with similar properties to vodka. 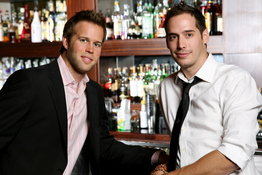 The brothers formed a company, named it VeeV Acai Spirit and moved out to Los Angeles. VeeV Acai tries to recycle nearly everything, transforming vinyl advertising banners into shipping bags and glass bottles into shot glasses and cheese trays. The company donates $1 to rainforest replantation for every bottle sold and takes environmentally friendly measures at tasting events. Lynn Caputo loved studying art in school, so using her wedding invitation company’s eco-friendly policies to benefit school art programs just made sense. Caputo’s mother, Mary, is a sixth grade teacher at Chandler Magnet School in Worcester, Mass. She spoke with the school’s art teacher, who was “over-the-moon excited” to use the supplies for class projects. Caputo says she plans to take a box of supplies to the classroom every few months. In 2007, Kristin Fintel was thrilled to realize her dream of opening a bed and breakfast, but something didn’t feel quite right. At Chehalem Ridge Bed & Breakfast in Newberg, Ore., Fintel’s lodgers were going through soap quickly, often not finishing a bar during a visit and leaving Fintel with hundreds of bards unsuitable for reuse. The native Oregonian and avid recycler turned to the Web, seeing ways to avoid wasting soap. Clean the World partners with hospitality companies and hotels to recycle partially used bar and liquid soap and distributes it to children in third world countries. Craft shows are wildly popular in northern Georgia, and Janice Walters-Taylor is a regular merchant, promoting her jam and jelly company. Wine is a main ingredient in her creations; she uses hundreds of wine bottles each year. In 2002, she began taking empty bottles to Bottle Benders, a company that transforms them into colorful wind chimes. “It makes me happy to know that the glass is not going to waste,” she says. Every few months, Walters-Taylor drops off a load of bottles at Bottle Benders. She often comes back with a wind chime, purchased at cost. “I always get excited to take my bottles to Bottle Benders,” she says. Courtney and Carter Reum of VeeV Acai Spirit.